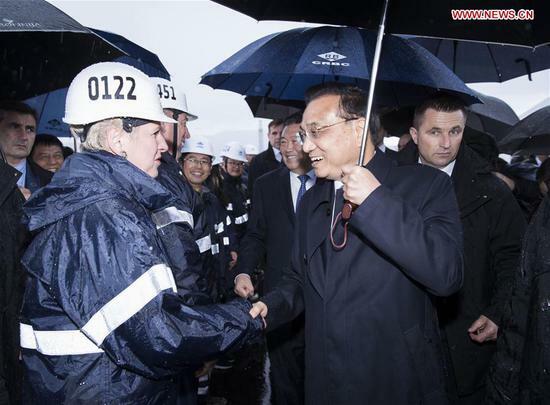 In heavy rain, Chinese Premier Li Keqiang and his Croatian counterpart, Andrej Plenkovic, jointly pressed a glass-ball button to start the piling of the main pier of a long-awaited Croatian bridge being built by a Chinese consortium. "I hope the Peljesac Bridge will be an excellent high-quality project that can withstand all rains and winds," said Li after pressing the button. Li made the remarks while visiting the construction site of the bridge on the Peljesac Peninsula in southern Croatia with Plenkovic Thursday morning. Li said the Peljesac Bridge project, acquired by Chinese enterprises through fair competition and public bidding, follows market principles and abides by rules of the European Union (EU). 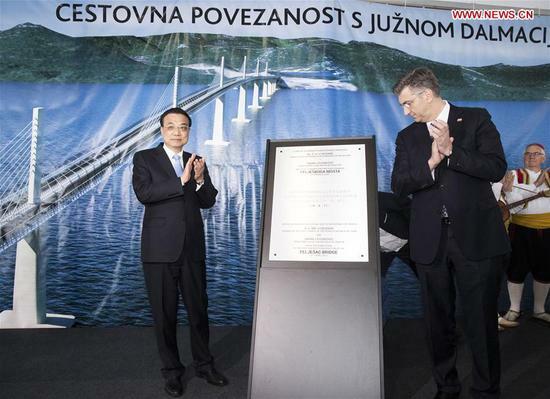 The bridge is "a model of tripartite cooperation among China, Croatia and the EU," Li said, adding that Chinese enterprises will build the bridge with the best equipment and technology and build a high-quality project. The total value of the project is about 420 million euros (about 472 million U.S. dollars), of which 85 percent will be covered by the EU funds. Hailing the bridge "a symbol of friendship and cooperation between Croatia and China," Plenkovic said it was Chinese friends that helped the Croatian people to turn their long-desired dream into reality. 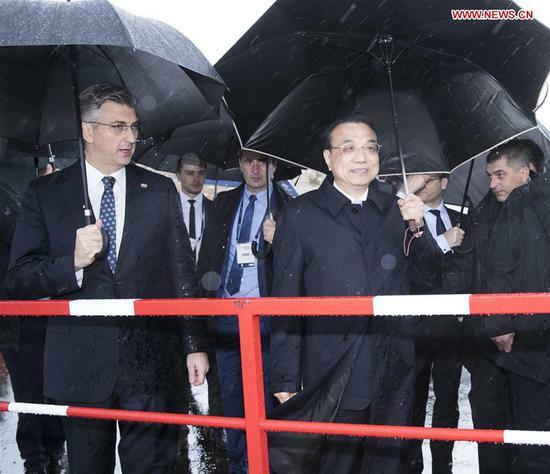 Li arrived in Dubrovnik Wednesday from Zagreb to continue his official visit to Croatia. He will attend the eighth leaders' meeting of China and Central and Eastern European Countries (CEEC) in the coastal city on Friday.